Saint James Church (White Church) is located in fatehgunj area of city. The church was built in 1824 as CNI White Church. The architect of the church was Sinkler Stevens, who made it in Indo-Gothic style. The church was made during the reign of Maharaja Sayajirao Gaekwad 2. The church is painted in white, which is why its known as White Church. The entrance of this church is from western side and on the left side of it, the stone in rememberance of Resident James Sutherland. Also stones mentioning British Officer’s William Kidman Lester and Sgt. Onoorv MD are seen on the wall of church. 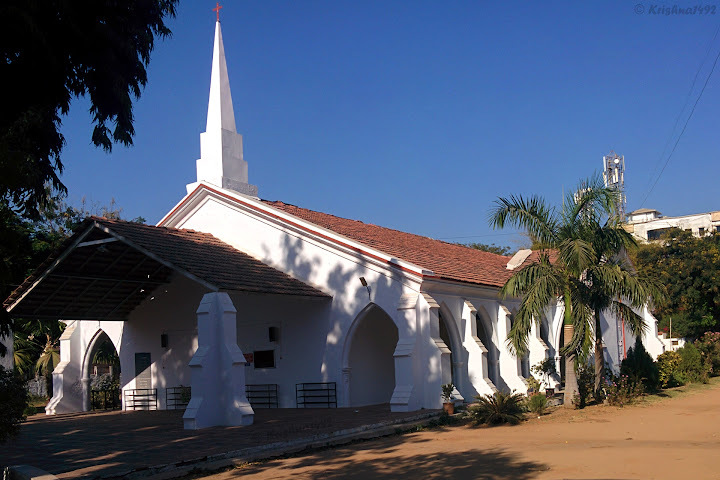 The White Church is dedicated to the memory of James Sutherland Esquire (1790-1840), Political Commissioner for Gujarat and Resident at the Court of Highness the Gaekwad. These type of church were also made in Borsad & Kheda, in which the church at Kheda is now lies in ruin ! The cemetery of White Church has 162 year old stone clock. The clock runs on Sun & Shadow, which shows the accurate timings till date. On one side, name of British resident James Sutherland is engraved & on other side, R Walles 1865 is seen. It is said that R Walles kept the clock in cementry, in remembrance of James Sutherland’s 20th death date.